Marking a fundamental shift in the history of the consumer electronics industry, the rising sales of multifunction electronics devices like smartphones and media tablets are resulting in a long-term decline in demand for single-task consumer electronics devices, according to the IHS iSuppli Home & Consumer Electronics Service at information and analysis provider IHS (NYSE: IHS). Shipments of smartphones and media tablets will rise at compound annual growth rates (CAGRs) of 28.5 percent and 72.1 percent, respectively, for the years 2010 to 2015. In contrast, shipments of portable navigation devices (PNDs), portable media players (PMPs)/MP3 players and digital still cameras (DSCs) will either decline or remain flat during the same period of time. Adding to the woes of single-task consumer products is the arrival of the media tablet.“Media tablets, predominantly the Apple iPad at present, are truly a jack of all trades—and master of most,” Selburn said. “This will put even more pressure on sales of single-task gear.”Although not directly acting as replacements for pocket-sized equipment, the media tablet increasingly will play an expanding range of roles for consumers, acting as an e-book reader, music and video player, browser, calendar, alarm clock, gaming platform, PND and camera all in one box. “The story of consumer electronics is an ongoing survival of the fittest, and multitasking systems such as media tablets will have a hand in turning yesterday’s hot consumer electronics gear into tomorrow’s fossils,” Selburn said. 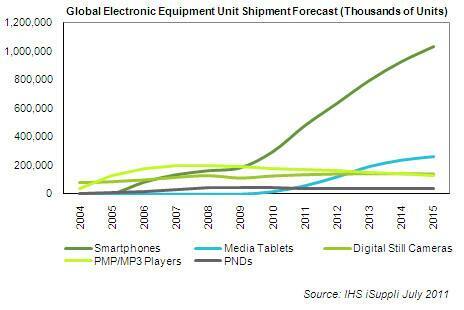 Shipments of media tablets will rise to 262.1 million units in 2015, up from 17.4 million in 2010. Smartphone shipments will increase to more than 1 billion units in 2015, up from 294.3 million in 2010. In contrast, global PMP/MP3 shipments are set to fall to 126.8 million units in 2015, declining at a CAGR of negative 6.8 percent from 180.1 million in 2010. Showing how dramatically market conditions have changed, PMP/MP3 shipments rose at a CAGR of 38.7 percent during the previous five-year period from 2004 through 2009. For their part, PND shipments will decline to 37.2 million units in 2015, with a CAGR of negative 2.2 percent from 41.5 million units in 2010. This compares to a booming 88.9 percent CAGR from 2004 to 2009. Learn more about the U.S. tablet market and consumer preferences with the latest IHS iSuppli reports entitled, Apple Outpaces Competition in Tablet Satisfaction Ratings and Apple Revitalizes U.S. Tablet Market.